Outside of Apple reporting quarterly earnings numbers moments ago, the day belonged to Motorola and Verizon. With three newly introduced DROID devices at varying price points, and with a set of new demo-friendly features to show off, we had a lot to cover this morning. But as the day is winding down, I’ve got to admit that I have dozens of thoughts running through my head, all of which involve these new phones along with their soon-to-be-introduced brother, the Moto X. Let’s talk about it all. 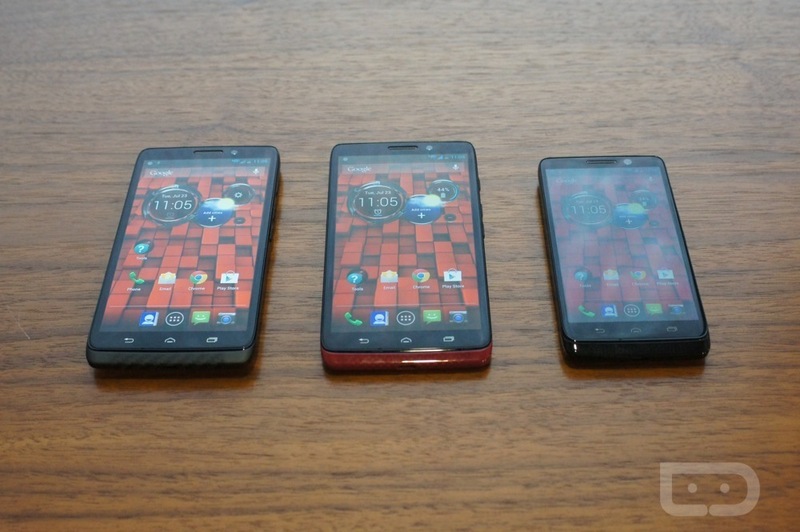 Motorola gave us three new devices today that would be tough for any normal person to tell apart. Sure, a couple are glossy and another soft-touch, but in terms of specs, they are almost all identical. We’re looking at three phones – the ULTRA, MAXX, and MINI – all running 1.7GHz dual-core Snapdragon S4 Pro processors, with 2GB RAM, 10MP cameras, and 720p HD displays. The ULTRA and MAXX are clearly larger in size than the MINI, and the battery capacities are different, but again, that’s not much of a difference. I’d have to say that the MAXX is the obvious leading choice of the three, simply for the fact that it has 48-hour battery life. But overall, do any of these devices give us a package that makes them better than the Galaxy S4 or HTC One? That’s a tough call. The specs certainly don’t scream, “We are better!” The displays aren’t better than either of those two phones. The processors aren’t as powerful. The cameras don’t have as many tricks. Maybe the user experience on the new DROIDs will be better? Unfortunately, we won’t know the full answer to that question until we can spend some extra quality time with them during a review period. Then again, I guess if you like mostly-stock Android with a half-dozen feature add-ons, you may be able to already answer that. At this point, after having spent 20-30 minutes with all three new DROIDs, I’m wondering what makes any of these phones more appealing than the newest offerings from Samsung and HTC, two phones that have been available for months. And now that I say that, didn’t we say the same thing when the RAZR HD was released last year? Cool and innovative or seen it before? You could argue that the new Active Touch, quick camera launch gesture, and always-listening Google voice actions features are going to help set these devices apart from the pack. But keep in mind that Samsung has just as many if not more gimmicks like these. We can only hope that Motorola helps to make them more useful then what Samsung has done. Motorola did bring up a new feature called Motorola Connect that they didn’t have on hand for a demo, but it sounds like one of the best of all. It’s an app or service that pairs with a Chrome browser extension on your PC to let you handle notifications through your computer. It’s not necessarily a new concept, but cool enough. They are also introducing something called DROIDZap as a picture sharing feature for device-to-device transfers. It sounds like something you will never use, and not just because it has a terrible name. They couldn’t really demo the idea because they only had one device paired to the service, but that’s sort of my early problem with it – the setup sounds far too complicated for any normal user to want to invest much time in. And other than those five or six features, nothing blew my mind today as being incredibly innovative. If anything, the coolest thing they talked about was their X8 Mobile Computing , which “involves eight tightly integrated processors, special algorithms, and sensors,” to create a an experience like no other phone. They have dedicated cores to manage audio sensors, others for graphics, and more dedicated to performance, all while producing industry leading battery life. But that’s all geek stuff, not necessarily mass-market consumer-focused. What’s left for the Moto X? If you have kept up at all with the Moto X saga, then you probably finished our DROID coverage today going, “Wait, I thought these new DROID features were all features from the Moto X?” You are not alone if you did. We couldn’t help but wonder, what’s left to make the Moto X standout after seeing Active Touch, “OK Google Now,” and camera gestures on these other phones? Sure, it’s being built in Texas and will give its users the chance to customize things like the outer casing, but we seem to be in a day and age that’s all about exclusive software features. Motorola just announced three phones that all have features we are supposed to see from the Moto X. There better be something else in the bag. What do these prices say for the price of the Moto X? I think the scariest moment from today’s festivities involved pricing. Verizon plans to sell these for $299 (MAXX), $199 (ULTRA), and $99 (MINI) on 2-year contracts. We’re talking specs that don’t even come close to the HTC One or Galaxy S4, yet are accompanied by prices at and above both of those phones. Keeping that in mind, the ULTRA is essentially what we’re looking at with the Moto X, so what does that mean for Moto X pricing? This morning, we talked about the idea that the Moto X could drop in for as little as $300 off-contract, but doesn’t today’s news worry you that there is no way in hell we are seeing it for anywhere near that price off-contract? That would be extremely unfortunate. While I fully understand that Motorola has put a bunch of engineering work into these phones, plus plans to build the Moto X in Texas, it still would seem absurd for them to charge more than a couple of hundred dollars for this phone. Camera shutter seemed a bit slow to me. Definitely need to spend more time with them, though. The glossy backsides of the Mini and ULTRA are fingerprint machines. They also feel gross. If you hate the slippery mess on the backside of the Galaxy S4, I wouldn’t even try to touch these. The back of the DROID MAXX is soft touch and feels identical to the RAZR MAXX HD. I really like that softness, just not sure I’m a fan of the kevlar design. The displays on the ULTRA and MAXX are definitely OLEDs. Colors are crazy vibrant, so if you like OLEDs, you’ll probably like these. I personally didn’t mind them at all. And I can’t wait to snag the wallpapers from them, because Motorola has all sorts of new good ones in there. If you are an LCD fanboy, well then, these probably aren’t the DROIDs for you. Motorola rep did mention these as being “Motorola OLED” displays. In other words, they are the only ones using them. The ULTRA is insanely thin. Someone at our press table asked about the bootloader – yes, it’s locked on all of them. Someone also asked how much bloatware would be installed, which gave all media at the table a good laugh. Unfortunately, a Moto employee there took the question seriously, and confirmed that they are still finalizing it all. The demos units had plenty already, FYI. Browsing around the phones showed no substantial lag or annoyances. All devices seemed very smooth and polished. Can probably thank this new X8 computing thingy. None of these phones have microSD card slots. At the end of today, we aren’t fully sure what to make of this new Motorola. We certainly saw three new DROIDs from them. The specs on them are not going to win any sort of hardware battle on paper, though. The phones feel like much of the same from last year, but with some added twists and gloss. The battery life on the MAXX sounds amazing. But I think until we get the Moto X, and see if it can somehow hold its own against its DROID-branded brothers, we’re already peaking one eye over the edge to see what else is on the horizon. Of course, you’ll want to stay on the lookout for our reviews of each device.